This book contains No Pictures, nor doodles, nor sketches of the Leprechaun nor any other elemental, only a few snapshots of the area she vacationed in. The writing style is relatively easy to comprehend. A woman’s account of spending a summer in a cottage inhabited by a family of leprechauns. She spends a great deal of time interacting with the elder male Leprechaun and also has many experiences with a few other elementals too. The book’s basic premise is that the leprechaun is studying her because the elementals want to become more like humans and want humans to become more like elementals. This book is Ms. Helliwell’s account of spending a summer in a cottage in Ireland in the late 80’s. The cottage is inhabited by a leprechaun & his family. The leprechaun tells her many things and takes her on etheric journeys to meet other elementals too. The basic premise is that the leprechaun is studying her because the elementals want to become more like humans and want humans to become more like elementals. Apparently, the elementals think humans are creators because we have freewill. I can’t figure what her idea of freewill is because the leprechaun ate or didn’t eat when he wanted, appeared or disappeared when he wanted, spoke or didn’t speak when he wanted, took liberties in personal manner when he wanted, expressed a full range of emotions just like any creature with freewill has and plus the leprechaun had a more efficient means of travel. The only part that the elementals didn’t have a choice over was their careers or caste as she calls it. The elementals, according to the leprechaun, are born into a caste and can’t choose any other direction in life. Yet, he was given the rare opportunity to choose to change his caste to the study of humans. He also had to answer to authority figures and follow what they told him to do or not do. According to Ms. Helliwell’s Leprechaun, Humans are creators and elementals are not. Elementals tend every aspect of our world, including human bodies. They make the fauna and flora grow, they make the flowers bloom and the berries ripen and everything. They control every aspect of the earth from sky to core. The idea of humans as creators is a bit confusing because we humans cannot create anything biological nor physical out of thin air, so, who is closer to being a creator in the aspects of creating? Ms. Helliwell stopped short of using the word God. Her overall mention of the supreme authority regarding all beings and all things could easily be translated as God. Because she refers to Jesus Christ a few times and reads her Bible, there is a basis to connect the dots. Just a note here: If you’re writing a book on your experiences: Why would you claim to have spent over 10 years of seeing elemental beings and not once either try to get a photo, doodle out a picture, hire someone to draw a picture or find a picture/figurine that resembles the elementals, to publish in your book? This book has alot of good things in it. I’m glad I own it and glad I read it. I recommend it, if you enjoy more modern takes on the fae or nature folk legends and lore. The new cover photo shows Ms. Helliwell standing in front of the actual cottage. I have this book on my wish list and haven’t read it yet. I’m working with Tanis Helliwell, author of Summer with the Leprechauns, and thanks so much for your kind words here on your blog about her experiences. 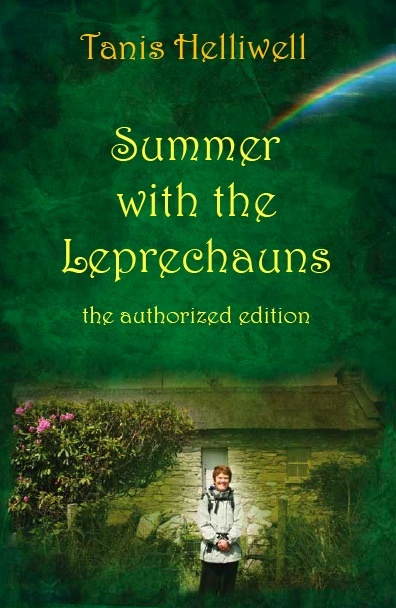 We redid Summer with the Leprechauns as an authorized edition that includes more of the leprechaun’s voice and Irish dialect, new map, cover, etc. Can we send you the new cover to post, that could replace the one you have here? it features a photo of Tanis standing in front of the actual cottage. Thanks so much – blessings from the leprechaun! Welcome to my blog. Thanks so much giving me an update. I’m so glad that you all have redid the book. I’d be happy to add the cover of the new edition of this book along with a short blurb about the newer content to my post. I’ve put the new version on my wish list and will hopefully be getting it soon. I’m always interested in learning more about the encounters and experiences with nature folks. we have stories about little people here in Northern Saskatchewan. Little people are sent to protect people.